Alice arrives on Nov. 2! Most of us are familiar with Alice Iddi-Gubbels accomplishments in Oklahoma City: graduating from OCU with a Masters degree in early childhood education and Montessori Teaching Certificate, teaching at Westminster School and starting PAMBE Ghana. However, Alice’s education and experience before PAMBE Ghana goes far and wide. Alice was among the first in her village to go to school and is one of the fortunate few to go on to college. She has a diploma in Home Science and Nutrition from the University of Ghana, Masters degree in Social Development Planning and Management from the University of Wales-UK. The common theme throughout her professional life has been education and social development in marginalized communities. Her work has been in health care, water supply, functional literacy and local leadership. From 1980-82, Alice led a community-based health care program in northern Ghana, organizing and training volunteer community health promoters and traditional midwives. 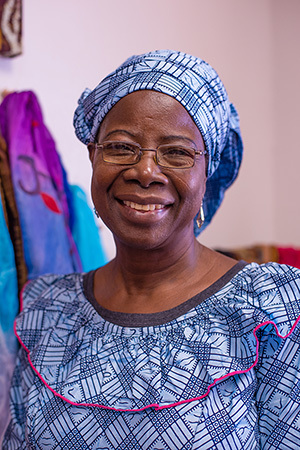 Alice worked as the World Health Coordinator for the Integrated Rural Development Program in Bassar-Togo from 1983-86, and as Family Health Advisor West Africa from 1986 to 1987. She worked with Oxfam-GB from 1987-1997, first as Deputy Regional Representative for West Africa and later as Country Program Director for Burkina Faso. Alice moved with her family to Canada in late 1997. In 1998, she managed the francophone Africa program, which included West Africa, the African Great Lakes region and Madagascar for the Canadian Catholic Organization for Development and Peace based in Montreal. She provided management and support to Oxfam Canada’s food security program in Ethiopia from 1999 until she moved with her husband to Oklahoma City in 2000. Since then, Alice’s career path has shifted to early childhood education, with the starting of PAMBE Ghana and La’Angum Learning Center.